Sunday, March 22 saw the official opening of Bang­kok’s friends of the arts foundation’s International Dance Festival, sponsored by Chiang Mai’s municipality. Chiang Mai’s mayor Dr Duentemduang na Chiengmai presided over the welcoming ceremony held at the Three Kings’ Monument prior to the first performance, and hosted a cocktail party afterwards in the Art Museum’s courtyard for the artists and the foundation’s supporters. The initial performance, aimed at the general public, comprised a ballet in contemporary style, Touch, given by the Oplas Theatre from Italy, and a programme by Janice Martin from the USA, a famous and multi-talented performer with a very unusual slant towards her areas of expertise. Janice Martin gets into the most unique positions whilst playing her instruments. Touch was followed by a unique performance given by Janice Martin, accompanied by a Thai drummer. An accomplished violinist, singer, dancer and acrobat, she amazed and thrilled the audience with her skills, and her ability to assume extraordinary yoga-based positions while still playing her violin! Three days later, on March 25, the Mandarin Oriental Dhara Devi hosted a performance of The Last Silver Crane, danced by soloists Olivier Vinklair and May Yimsai and a small company. Based on the legend of the Silver Crane, which brings back humanity and the balance of nature to both the earth and the universe, the dance was performed in an ideal environment surrounded by trees, in which, as part of the performance, Janice Martin amazed the audience with her aerial acrobatics. A mention should be made of Chulachart Arunyanak and Phatarakij Phumpipat’s masculine dance styles, in a performance which seemed very Cirque du Soleil in its improvisatory nature and its blend of ‘East meets West’ modernity and a legend as old as time. The International Dance Festival also included several workshops and master classes on creative movement, contemporary dance, percussion and choreography as well as another performance at Airport Plaza, reaching out to as many people as possible during the 4-day event. For more information look up http://friends-of-the-arts.info/. all beautifully dressed for the occasion. 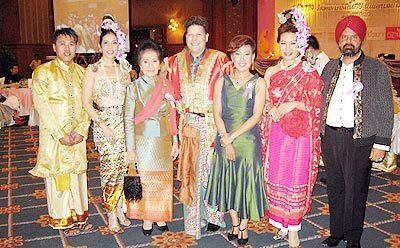 A Lanna Fashion Show and charity event was held recently in Bangkok, in aid of Her Royal Highness Princess Soamsawali’s foundation in support or children who have fallen victim to HIV/AIDS. The event was chaired by the Princess herself. Other guests of honour, several of whom were from Chiang Mai, included Chao Dr. Duangduan na Chiengmai, president of the Chiang Mai Chamber of Culture, Chiang Mai University’s Assistant Professor Songsak Wattanakul and Mom Luang Preeyapun Srithawat, director of the Chiang Mai Ballet Academy. The event was sponsored by Beauty Gems, Beeraya Productions, H1 Organizers, Tilleke & Gibbins Clothes, Srisanpanmai, Siam Technical College and Thailandfreunde e.V. and was an important representation of Chiang Mai’s Lanna culture and arts. Before the fashion show and entertainments began, Asst. Prof. Songsak presented a historical background of Lanna fashion and its manufacture, in both former and modern times. An exhibition had been set up, with many booths showing typical and beautiful examples of clothes and accessories, both for admiration and for purchase. The Siam Technical College presented the spectacular traditional Thai dance and fashion show, together with a traditional Thai orchestra and singers. Her Royal Highness Princess Soamsawali was presented with many gifts and donations to her foundation. In return, she presented medals of honour to 40 of those in the audience who had helped to arrange the event, or had given donations to her foundation, including Mom Luang Preeyapun, Thailandfreunde e.V.’s president Dirk Weeber-Arayatumsopon, Wuttipong Arayatumsopon, president of Thailandfreunde Thailand (which had donated 200,000 baht) and members of the board, including Frank Sethi of Fashion King. Chiang Mai’s mayor Dr Duentemduang na Chiang Mai and representatives of the Municipal Authority recently visited Boonpan Vichienchom at Chiang Mai Municipality Hospital. Boonpan is receiving care under the ‘Railway Community Project,’ which is committed to providing home health care, wheelchairs and up to 20,000 comfortable beds to disabled patients. The mayor explained that the project, since last September, is also able to provide homecare visitors to those in need of such services. Chatpong Chensuwankul, director of Chiang Mai Municipality Hospital, added that the aim of the project is to introduce follow-up visits, to spread knowledge about caring for the disabled in the home environment and to inform about modification of the home in accordance with the patient’s requirements, thus reducing the need for frequent hospital visits. The project is looking for donations of necessary equipment such as beds, wheel chairs and suction machines. Anyone able to help as asked to contact the hospital on 053-223-215 or 053-282-380. Prem International School has announced a new community outreach project in which it will be joined by Care for Dogs, and are asking for compassionate dog-loving students who will help care for dogs currently living in Nong Pla Mun village’s temple. It is hoped that the project will also strengthen ties between the school and its immediate village neighbours. At present, 10 dogs are living permanently at the local temple. Volunteers will each be given the responsibility of total care for one dog, including giving vaccinations, organising spaying/neutering to prevent unwanted pregnancies, bathing, fundraising, basic doggy healthcare and training. Most importantly, lots of love and cuddles need to be given, something these young dogs have never experienced. Care for Dogs is generously sponsoring the cost of the vaccinations, the spaying/neutering and the post-operative recovery time. Ajarns Sandy and Joy Huss will be supervising all ‘Hands to Paws’ activities at the temple, and would like to have all the dogs vaccinated against canine parvovirus, distemper and rabies by the end of this month. Following that, the 8 female dogs at present resident will be spayed. As George Bernard Shaw noted, ‘The worst sin towards our fellow creatures is not to hate them, but to be indifferent to them. That’s the essence of inhumanity.’ He was right, of course! For more information, to be included on the mailing list or to volunteer for this exciting new project, please email Sandy at [email protected] .org. Once the project is officially underway all interested students will be advised of upcoming events. 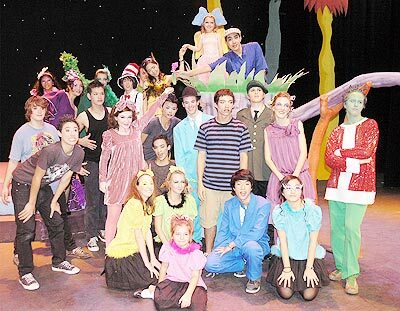 The ‘Seussical’ cast from the Chiang Mai International School. The Kad Theatre came into its own again last weekend, when the Chiang Mai International School (CMIS) mounted another ambitious production Seussical. After the great success last year of their Sondheim musical Into the Woods, they were once again in ‘fairy tale ‘ land. 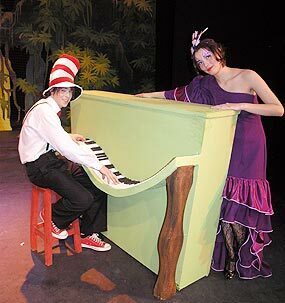 Seussical, inspired by Dr. Seuss and co-conceived originally by Eric Idle, with music by Stephen Flaherty and lyrics by Lynn Ahrens, is a lighter and more accessible performance vehicle than Sondheim’s masterpiece, although there are a few dark moments. The young performers carried off the songs and dances with aplomb. The School’s production was brisk and lively enough to keep the audience of very young children and adults entertained without an interval, telling its tale of ‘Who,’ the smallest planet in the sky. The moral is straightforward. One doesn’t have to be big to be beautiful, nor should one warrant persecution because of ones smallness. As it asks for tolerance, the story, centered around an elephant and a young boy, suggests that sometimes that quality is in short supply in the world. Even in Chiang Mai, we may all be able to agree with that sentiment. The large stage, at the sadly underused Kad Theatre, was full of vitality from the outset and the good humour of the cast made the best of the musical score. The young cast carried the songs and dances along and made the best of the complicated narrative, which possibly meant more to the children present than to many adults. Chi Kelly from the Saturday matinee’s audience, there with her husband Scott and daughter Jasmine, thought the whole production was very professional and that Gertrude, played by Sally Kwon, was especially delightful. Ronny Lavin, another listener, drew attention to Mayzie, played by Coco Koeooder, whom, Ronny thought, had given a ‘mature beyond her years’ performance. Scene and costume changes were rapid and efficiently managed. Any lack of experience from the school-age cast was more than compensated for by their enthusiasm. Outstanding among many talents was Chakree Matayananat as the put upon Horton the elephant. Chakree’s engaging personality and attractive voice gave the wistful role special emphasis. Joseph Newport, as the ‘thinker’ Jo Jo, was also bright and appealing as the young man who rebels against war. The entire performance was very much a team effort, with no-one letting the side down. The actors, the technical crew and the senior staff were all deserving of the enthusiastic applause from the audience at each of the four shows. Three of the ‘grown ups’ involved, choreographer Sallyanne Wichai, technical director Suwannee Eubank and director and musical director Ruthanne Pilton should surely be feeling very proud of their achievements. The Chiang Mai Mail would like to thank Ruthanne, who is expected to move on to pastures new in the near future, for her hard work for the community and the students, and wish her all the best for the future. A launch party for Elite Property Company was held recently in the glamorous setting of Dalaabaa restaurant. 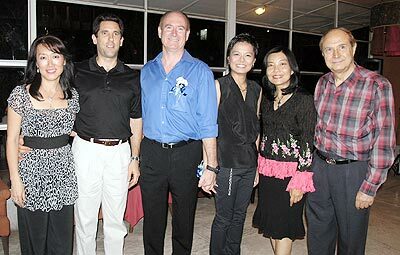 The amiable Patrick Mulcahy and his lovely wife Krongkwan (Kay) invited over 50 guests to join in the celebrations on their special occasion. 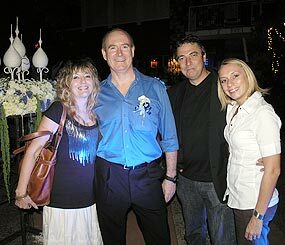 Elena Edwards, Chiang Mai Mail, with Patrick Mulcahy, Chas and Rachael. During the party, guests enjoyed fine wine and delicious food, with music provided throughout by an expert DJ, who soon had ‘les girls,’ including Shannon Morrow, up and dancing! The majority of the male guests, however, seemed more than content just to sit and watch. Either way, it was a very successful launch. Elite Property can be contacted on www.eliteproperty .co.th or 084 378 4804. The monthly Expat Ladies’ Lunch group met last week in the congenial and familiar surroundings of the Empress Hotel’s buffet, where a private room had been booked for the smaller than usual group. Nine ladies, perhaps the pollution had scared off the rest, were present and thoroughly enjoyed the rare opportunity to sit and talk with no distractions. Great fun! So much so that hotel staff were vacuuming the room and getting ready for the dinner servings by the time the group left! For next month’s event, to be held on April 28, the Grandview Hotel on the Superhighway is the selected venue, providing a pleasant dining area with lots of multi-sized and very cute white ceramic elephants as decoration, and a good buffet.